Peter has been a Toastmaster since 1992 and he became a Member of The Institute of Toastmasters of Great Britain in 1998. He has served as a Member of the Executive Council of the Institute and was elevated to the Office of President in May 2006. 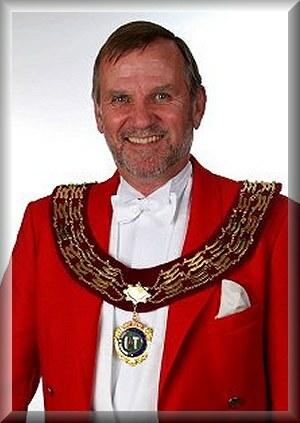 During his long career as a full time Professional Toastmaster, Peter has officiated at almost every type of Function, Civil, Corporate, Masonic Ladies’ Festivals, Round Table Nights, Sporting Dinners, Barmitzvahs, Batmitzvahs and of course Wedding Receptions of all faiths and denominations and Same Gender Commitment Ceremonies, all fall within the compass of Peter’s expertise. Peter, together with his wife Linda, also runs a Function Organising and Coordinating business, so from every respect Peter fully understands the requirements, the detail, protocol and etiquette needed for all Functions. In the Function Suite, the Food, the Wine, the Service. The Toasts, the Speeches, the Flowers, the Gifts, the Cake. The Band, the Disco, the Entertainers. The receiving line; who should be included and who should be left out? Who says what, when do they say it and who do the say it to? When do you ‘Take Wine’? What is ‘Wine Taking’ anyway? In what order should the Speeches be made? What should be the content of the speeches? Who proposes which Toast, when, and to whom? Who responds to these Toasts and when? What is the correct etiquette or protocol for all situations? OF A TRAINED, QUALIFIED AND PROFESSIONAL - TOASTMASTER!